I thought you guys might enjoy this picture taken aboard the USS Clarion River (LSMR-409). I didn’t take it and there is no name on the back. I estimate 1968. Same old story. We were decommissioning the ship and somebody said, “Do you want these photos…?” I said “Yes” and here’s one. Launcher #4. He just caught one round in the air. Other round was either in launcher still or already out of frame. There was a slight delay between the two rockets going out so that they didn’t hit each other in the air because, as I was told, “they wobble a bit.” Somewhere, I believe I have a photo catching both rockets in the picture. Note how ship is rolling to starboard because of the recoil of the rocket. Just kidding, no recoil. Ship rolled when somebody shifted from one foot to the other. Really a tippy ship. Drew seven feet forward and nine feet aft with a flat bottom. Even the twin screws were recessed into the bottom of the hull so that she could be run up on the beach. As best I recall, we never grounded LSMR-409, even on purpose. The water we went into while shooting missions was often so shallow that the cooling water pumps sucked sea shells and bottom trash into the system though, so we couldn’t have been far above the bottom. The range on the rockets was pretty short and the closer we got to the shore the more area we could bombard. Clampdown the main deck and all upper decks. The plan is to swab up all of the rainwater and anything else that has collected overnight on the decks, throw the flying fish over the side and drink a cup of coffee while the morning sun makes the damp deck steam and the world is quiet. “Secure the Chow Line.” “Muster on station.” “The ship expects to set Condition One Rocket at 0800.” Gunner’s Mates and Fire Controlmen begin getting the rocket launchers ready for the days’ mission. Test firing circuits, test the “automatic” train and elevation circuits that send target information from CIC [Combat Information Center] to the rocket launchers. Test sound powered phone circuits. 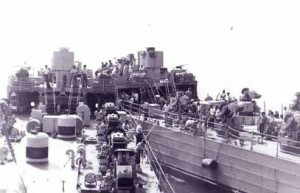 Gunner’s mates remove the herculon covers from the guns and launchers while other gunner’s mates remove the tops from the rocket cans in the launcher handling rooms and in the ready service magazines. Mount 41 and Mount 51 crews light off their mounts and check train and elevation motors as well as sound powered phones. Fire Controlmen and Radarmen prepare CIC for the day’s mission, laying out NGFS [Naval GunFire Support] charts and navigation charts. Enginemen check their phone circuits, make sure the diesel day tank is filled for the day’s steaming and the GM 16-278A main engines and air actuated clutches are ready to answer all bells [they will get a real workout during the fire mission]. Quartermasters pull out navigation charts for the coast of the local area and put them on the chart table. IC men check communications throughout the ship, including the 1MC and the 21MC. Cooks and Messcooks serve the morning meal and clean up so they can go to their One Rocket stations. Radiomen check and test the radio circuits for the day’s mission and route the overnight message traffic. Officers and Chiefs read the overnight message traffic and begin drafting answers. They also help with problems encountered in getting ready for the mission. Bridge crew concentrates on getting the ship to the designated point on the ocean where the ship is expected. The point is an arbitrary point NEAR where action is expected that day. The bridge crew has no idea what the tactical situation is “on the beach” where the troops might need fire support. At the end of the day, the crew of the Rocket Ship still will not know what the tactical plan or situation on the beach was . . . only that they have done what they were asked and maybe there will be a damage assessment and a thank you from the spotter. After a few days of these types of missions, it was easy to begin to think that your ship’s contribution to the war effort was pitifully small. The spot on the ocean where the ship must be in order to be ready for the mission can be approached in different ways. Some officers of the deck prefer to get there very early and steam back and forth. Some prefer to appear just in time and be passing over the spot when 0800 arrives, although this is risky business because anything mechanical or operational could delay the ship. If not on station and ready for the Fire Mission, many people, beginning with the Captain of the Clarion River, will be upset and that is not a happy thing for the bridge crew. One morning, we spent about 30 minutes figuring out how to steam in a perfect circle about 1000 yards around the point but I don’t think we ever got it just right. Now, I should mention that most of the crew has been up some or all of the night before, so they are pretty tired. Some have been just running the ship in a four hour watch system, standing one watch in three and some have been shooting H&I missions, Harassment and Interdiction. About 1600, the local area commander would tell the gunfire support commander what real estate in the RVN was to be “denied” to the enemy overnight. The commander would designate certain points on the ground where the enemy MIGHT be and ask the Clarion River to “Harass and Interdict” those points on an irregular basis throughout the night time hours. So, a single launcher crew, a skeleton fire control crew and a gunnery officer would be on watch all night. Their job would be to fire one rocket salvo or 5″/38 round on each of the designated coordinate points at a random time of the hour, every hour, all night. There might be eight points on the ground designated—a crossroads, a canal intersection, an assembly area, a base camp. So this meant eight salvos during each hour. Not enough to keep you busy and too many to allow the teams to catch a cat nap. Numerous schemes were devised to make these salvos random and unpredictable. Probably none of them worked very well. I suspect that some crews tried to fire all of their rounds in the first, last or middle 15 minutes and sleep the rest of the time, but I couldn’t say for sure. 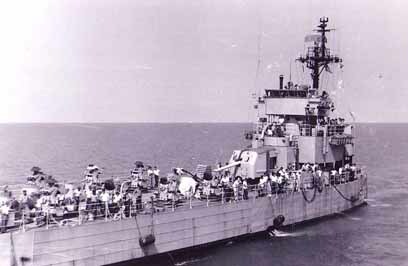 Since only one launcher or gun mount was firing, the rest of the crew that was not on watch could sleep. “Now,” you ponder, “How could ANYBODY sleep with those rounds being fired every hour all night?” I can personally testify that after about a week of this routine, you can sleep through anything. We all have interesting pictures of each other sleeping in various places around the ship at various times. Most of us believe to this day that H&I was more of a detriment to us than to the enemy. After about fifteen minutes, the 40 MM crew will be taking off their shirts to get a sun tan and hiding behind the splinter shield and the director tub so the captain can’t see them, anyway. There will be one special guy, like GM2 John B. Santopietro of Altoona, PA who puts on an asbestos fireman’s suit and lounges around on the deck in the RVN heat. He has a special job in the event of a misfire. It takes four men to operate the loading mechanism in a rocket launcher handling room and there are eight launchers, so every extra man is appreciated when the mission gets underway. Those rockets are heavy and passing them tires the crew out pretty fast. When a call for fire comes, nobody wants to tell the guys on the beach “we’re tired, we’ll be with you in a minute.” Every man who is not at his GQ station is either in the rocket handling rooms or on a damage control party. All stations report manned and ready, the ship slides across the designated point on the ocean and everyone is ready for the Fire Mission du jour. The captain picks up the radio and calls the spotter to tell him we are on station and ready for a fire mission. The captain goes for his backup radio, a PRC-25. No answer. We [you guessed it!] WAIT. Finally, the spotter check in on the net and we are ready to go to work. We get the Fire Mission orders. We set up the solution. We announce we are ready. We shoot, he spots, we shoot more, and he spots more. We finish the mission. We wait. Another mission and another. We get “bomb” damage assessment reports. The captain passes the word over the 1MC. “You sank a sampan, you got multiple secondary explosions and a pile of rice” or whatever we hit. Suddenly, the morning is gone and it is lunch time. If we are lucky, we take a break, secure and eat whatever lunch the cooks have been able to make without leaving their One Rocket stations where they were busy passing rockets or sitting in a bored damage control party. Probably cold cuts and bug juice, BUT GOOD! Back to One Rocket and more fire missions until 1700. One by one, the launchers develop problems until at the end of the day, we might have only four launchers working. 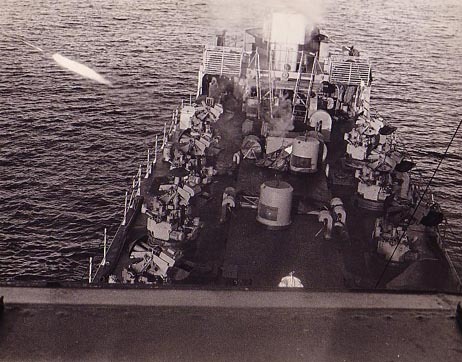 Now, the ship has experienced several types of misfires and mishaps with the ammunition we are shooting. All of the rockets we saw were manufactured in 1945 or thereabouts. This old ammunition had been on pallets and in storage for nearly 25 years and had been moved by fork lift, crane, barge and highline transfer many times. Some were a little worse for wear. Unfortunately, you could not tell which ones just by looking and there were so many of them on board that the bad ones were only found by firing. One type of mishap was the close in premature. The point detonating nose fuse on the 5″ spin stabilized rockets we fired had a safety device on it so that contact on the point of the warhead fuse would not [necessarily] detonate the fuse UNLESS the fuse was spinning as it did when launched. It was supposed to have a 50 or so yard safety distance from launch also. Sure enough, it seemed like about fifty yards when, once in a while, they warhead would explode right after launch at about 50-100 yards from the ship. Another mishap, which could occur, was the “dud” rocket where the rocket motor failed to ignite. That is where Santo got to do his job, tripping the bore clear switches, taking the dud out of the launcher into his arms and dropping it over the side so some RVN fisherman could find it with his net next year. Occasionally, instead of a dud rocket, the rocket motor case would break, fail or burst, dropping flaming solid rocket propellant on the ship’s deck and ruining the First Lieutenant’s paint job and anything else in the way. The last type of exciting mishap was a “short” round that went only a few feet before falling on the deck or into the water. Although with these “short” rounds, the warhead never exploded as far as I know, the captain took a dim view of shooting the port side launchers across the deck at a target off the starboard side of the ship. For this reason, the engineering crew and the Officer of the Deck were kept busy during the fire missions keeping the ship “parallel” to the beach and dead in the water [not moving forward or backwards]. 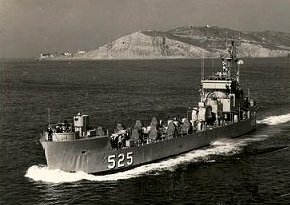 In this way, if the ship’s starboard side was facing the beach, the four starboard launchers could be used without shooting over the port side and vice versa. The ship could be turned after a while and the port launchers used while the starboard crews were given a chance to restock the ready service cans in the handling rooms from the extra rockets carried in the centerline magazine. Keeping the ship parallel to the beach was hard on the engine room crew and the bridge watch. It involved almost constant shifting of the engine clutches from ahead to astern . . . “Port ahead one third, Starboard back one third, right full rudder . . . All Stop . . . rudder amidships . . . left full rudder Starboard Ahead one third, port back one third . . . all stop . . .” Remaining dead in the water made the fire control solution MUCH easier for the CIC and quartermasters. The Clarion River lacked the sophisticated gunfire control systems and computers that the destroyers, cruisers and battleships had. Instead, we had the mechanical computer Mark V. It was so inaccurate that we never used it. Instead, the captains before us had determined that we could do as well or better by picking a spot, staying in that same spot, and taking a navigational fix [bless you Radarmen and Quartermasters . . . shooting fixes using canal mouths and hooches on the beach ! ! ! ! ! . . . the east coast sailors would laugh at that]. THEN, the CIC crew would plot the ship’s location on an NGFS chart. When the fire mission came in, the location of the target would be plotted using a converter board [formerly, in our politically INcorrect lives, known as a Comanche Board] and the same NGFS chart. Then, using the highly technical method prescribed, they would lay a plotter [a glorified ruler] down, connecting both points with a line. The range and bearing would be read from the scales on the plotter. The range would be converted to an elevation by reference to a printed table and those readings would be cranked into dials in boxes on the bulkhead. The rocket launchers would “automatically” slew around to the designated bearing and elevate for the correct range—that is if the gunner’s mates had remembered to engage them in automatic before they went below and IF everything was working properly. The gunnery officer in CIC would report that the battery was ready and captain would look out on deck JUST TO MAKE SURE that none of the launchers was pointed at the bridge and then would announce to the spotter that we were ready. If one of the launchers in use happened to be pointed at the bridge, or was waving about more than usual or was obviously not elevated in line with the others, it was either shut down and another launcher prepared or good old Santo would go out and put it in automatic. Then we were ready. John Kinder, who was a crewmember onboard of the USS St. Francis River (LSMR-525), took this photo showing the “sophisitcated” fire control system on the LSMR’s showing the tdt on the bulkhead in CIC. It shows the equipment being operated by an unknown Fire Controllman (FT). When the order came to “shoot” [OK, Army guys, we don’t say “fire” on the ship because a fire is a very bad thing on a ship and “fire” is reserved for the real thing.] the gunnery officer would close his “firing” key in CIC, two rocket handlers would set a pair of rockets on the loader tray and push them into the hoist. [They might have set several rockets on the tray already in preparation if the sea was not very rough.] The rocket launcher tubes would go to the vertical position. Hydraulically operated cable “whip” hoists would sling the rockets up from the rocket handling room below decks into the launcher tubes, the launcher tubes would go back to the prescribed elevation and the electrical circuit in the launcher would ignite the rocket motors [one just before the other] and the rockets [hopefully] would go out of the launcher and to the target. The launcher tubes would go to vertical again, the rocket handlers would load another pair and the process would repeat until the requested number of rounds were fired. Of course, the mission was passed to the launcher captain in the handling room so he knew when to stop loading when his rounds were complete. “Rounds complete . . . standing by . . .” And so it went all afternoon. When the spotter released us for the day, it was time for us to do our regular shipboard routine jobs, cooks cook, engineers engineer, shipfitters fit, yeomen yeo, supply clerks clerk . . . gunner’s mates fix what broke during the mission and there is another story there. Then supper, stand your steaming watches, eight o’clock reports, the evening movie, TAPS at 2200, H & I all night and up the next day to do it again. Just a routine day on a Rocket Ship. Although there is little “chance” involved in the gam between the 536 and 409, the navigator always is a little nervous when told to go to a PARTICULAR spot in the ocean. He always “knows” where he is, but when that knowledge is compared to the knowledge of another navigator or a rocky promontory, it is a nervous moment for him. Nevertheless, the ships approach each other and, with the advantage of radar, come into view. White River is shown framed in the aircraft sights of MT 42 Director. A crowd begins to gather when the word is passed, “First Division, Standby to receive the White River alongside to starboard.” ENS Shenk watches from MT 42 Director tub just aft of the Chart Room. White River is now within “spuds from the quarterdeck” range. After a couple of hours of trade and conversation, smoking and joking, reversing the process and going our separate ways, it is back to the business of the Gunline. Meeting a ship like this, out of sight of land, gives us the impression that we are the only two ships and the only people on earth at the moment and just like that, the effect is shattered and we go back to reality, such as it was in Viet Nam.